Queso Fundido is about as cravable as you can get, especially when there is chorizo mixed in with the cheese like hidden little bombs of flavor just waiting to explode when you take a bite. 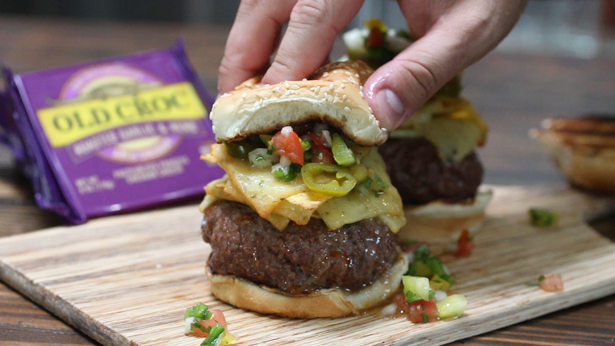 I decided to stuff this popular app into a burger and top it with the chips you would use to eat it with! 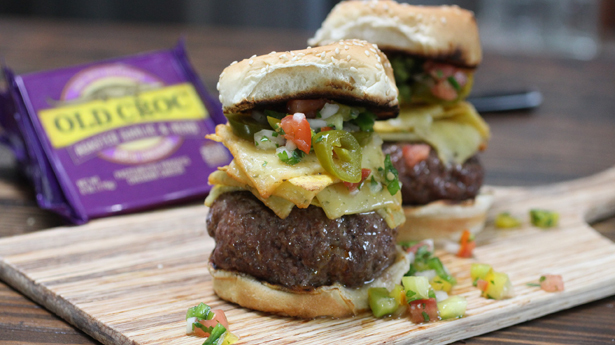 I used the Old Croc Cheese Roasted Garlic and Herb flavor for this burger and not only did the flavors go perfectly with this style of burger, but it also saved a step of adding actual garlic to the burger filling. I made a video showing the whole process which you can watch below, or keep scrolling to see photos and the actual written recipe. Chopped chorizo for the center of the burgers. With lots of cheese. As it cooks, pile it high with chips and more cheese. Melty goodness. Top with chorizo and pickled jalapeno. Juicy and so good. And the cheese inside is just waiting to ooze out. Cut each block of cheese into 16 thin squares by first cutting it in half both ways into 4 cubes, then turning each cube on its side and slicing it in half, then each half in half again. Alternatively, you could use the sliced version of the cheese and break each slice into 4 squares. 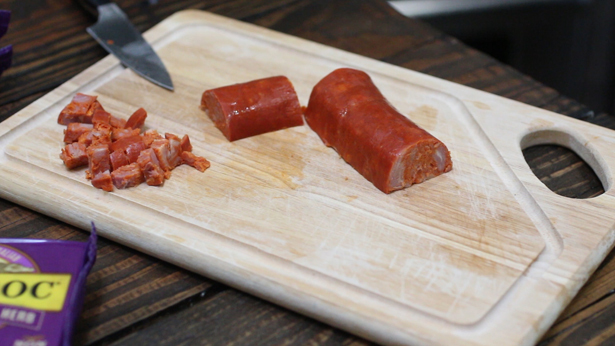 Cook the chorizo in a hot pan to brown and remove from heat. Break the beef into 3 equal pieces. Flatten the beef and place 1 piece of cheese down, then add about a tablespoon of chorizo. Top with 2 more pieces of cheese. 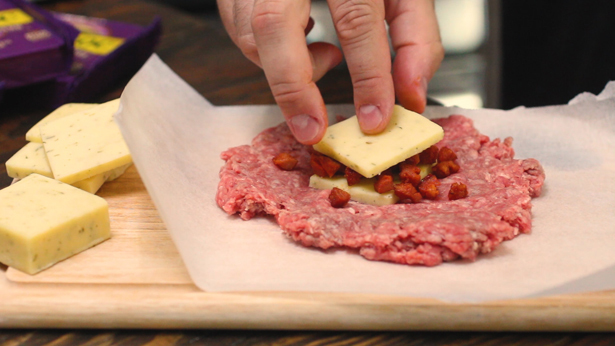 Wrap the beef all around the cheese and make sure to seal it up around the cheese. 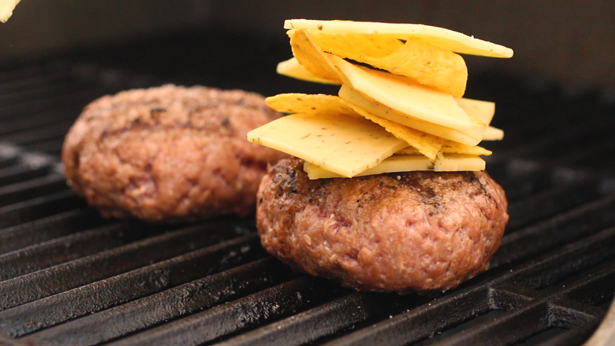 Grill the burgers on high heat to brown and cook through. 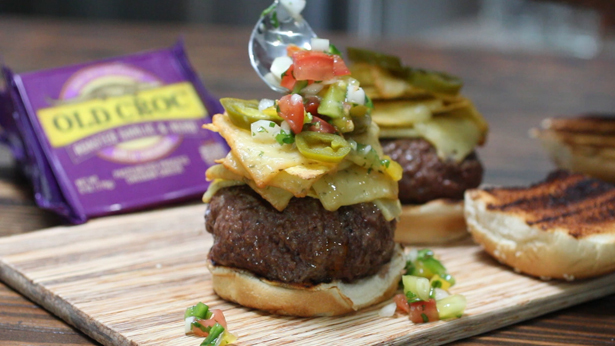 After flipping, top each burger first with a piece of cheese, then with about 7-8 tortilla chips, alternating with a slice of cheese in between each chip. 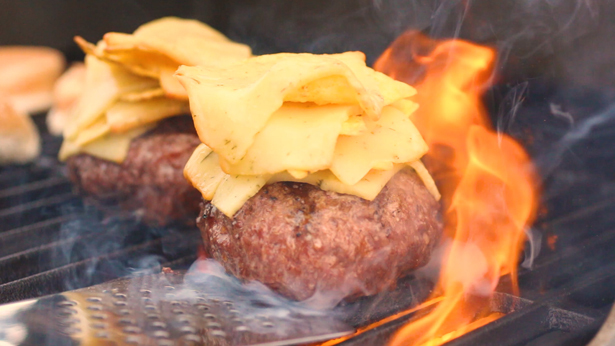 Cover and cook until the cheese is melted and the burger is cooked through. Put the burger on a bun and top with pico and jalapenos and serve. Im having a hard time finding all the extra flavors of old croc cheese in my area…any suggestions? 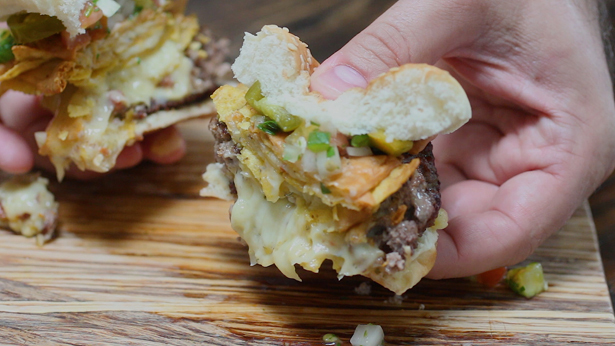 we have been looking since the carnita burrito recipe you posted.. really the only reason we havent made it yet…. Hi Sarah – The flavors are new, and not available in all stores (yet!) 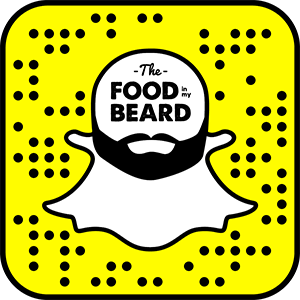 Come on over to our Facebook page or send us an email with the town you grocery shop in, and we’ll help you find some Old Croc!